The Empire is in dire need of your aid! Click here to play! To stave off the malicious invaders you must enlist the help of the Orient Express's most fearsome warriors: the Galleys of Death, the Tiger Army, and the Red Dragons. Help defeat the enemies in this enthralling 5-reel, 21 pay-line slot machine! The Red Dragons are your finest allies, and if you manage to have 5 of them appear on one spin you will be paid out 2500 times your initial bet. The 21 pay-lines offer you a range of ways in which to win, not just from left to right but diagonally as well! Orient Express is such a simple slots machine to play, and offers countless ways in which to win big. 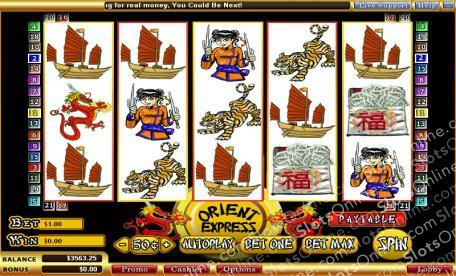 So ready your sword, gather your hordes, and prepare to take home massive winnings in Orient Express!